You may have taken the CrossFit Mobility Course with her as your instructor. You may have heard about the Wounded Warrior CrossFit class she leads in San Diego. It’s possible you are familiar with the company she founded, Movement Rx. Dr. Theresa Larson, DPT knows what CrossFit can do for your physical strength. But in her forthcoming memoir, Warrior, she shares what true strength is and how she came to find it while battling herself and her circumstances. Theresa hopes that through sharing her story, she will help inspire others to empower themselves, embrace their inner warrior and re-define strength. Startling and funny, terrifying and triumphant, heartbreaking and inspirational, Warrior is at heart a story of perseverance and success—of a determined woman who is model for everyone struggling to conquer their own demons. Theresa shows that asking for help can be an act of courage, and that we are stronger than we think when faced with seemingly impossible odds. It’s a story that will resonate with most people who like to spend time inside the box. It’s already receiving advance praise from CrossFit luminaries Kelly & Juliet Starrett and Coach Burgener. Click through to warrior.drtheresalarson.com for Sneak Peak chapters. You can also Pre-Order your copy before they arrive in stores April 5th. 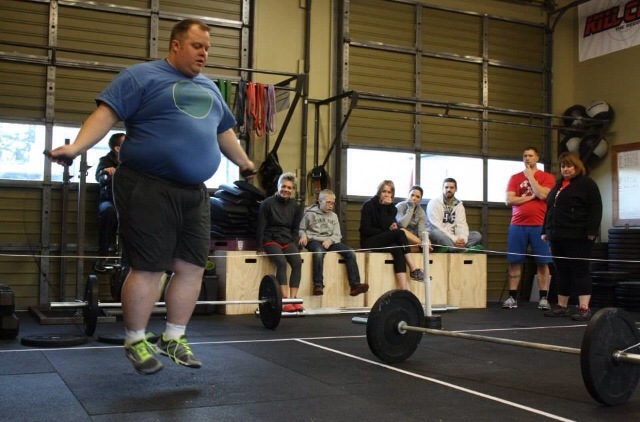 This is a great, inspiring post from the Crossfit HQ website. I learned what community means… It is people that cheer where you are going more than where you are at today. Crossfit STL on M, W, F at 8:30 AM. Sign up to reserve your rower!